मध्य-आधार Under the law of the sea, an Exclusive Economic Zone (EEZ) is a seazone over which a state has special rights over the exploration and use of marine resources. Generally a state's EEZ extends to a distance of 200 nautical miles (370 km) out from its coast. The exception to this rule occurs when EEZs overlap; that is, state coastal baselines are less than 400 nautical miles apart. When an overlap occurs, it is up to the states to delineate the actual boundary. Otherwise, any point within an overlapping area defaults to the most proximate state. 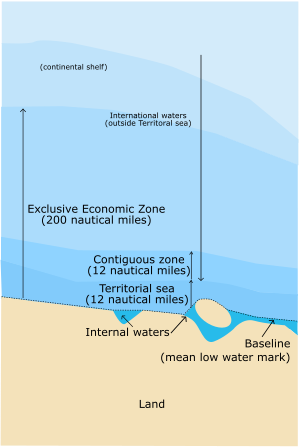 The Exclusive Economic Zone starts at the coastal baseline and extends 200 nautical miles out into the sea, perpendicular to the baseline. Thus, the EEZ overlaps both the contiguous zone and territorial waters. This concept of allotting nations EEZs to give better control of maritime affairs outside territorial limits gained acceptance in the late 20th century and was given binding international recognition by the Third United Nations Convention on the Law of the Sea in 1982. Fisheries management is a significant aspect of the resulting control. Disputes over the exact extent of Exclusive Economic Zones are a common source of conflict between states over marine waters. One well-known example of such a dispute is the Cod Wars between the United Kingdom and Iceland. There is an ongoing dispute over defining continental shelf and EEZ between Turkey and Greece. Regions where a permanent ice shelf extends beyond the coastline are also sources of potential dispute. Australia has the third largest Exclusive Economic Zone, behind the United States and France, but ahead of Russia, with the total area actually exceeding that of its land territory. As per UN convention, Australia's EEZ generally extends 200 nautical miles (370 km) from the coastline of Australia and its external territories, except where a maritime delimitation agreement exists with another state. Australia has also claimed, in its submission to the UN Commission on the Limits of the Continental Shelf, an EEZ of 200 nautical miles (370 km) from its Antarctic Territory but has requested it not be considered, in accordance with the Antarctic Treaty. Nevertheless, Australia maintains the right to explore and exploit the seabed and water column within its EEZ. Canada is unusual in that its Exclusive Economic Zone, covering 2,755,564 km², is slightly smaller than its territorial waters. The latter generally extend only 12 nautical miles from the shore, but also include inland marine waters such as Hudson Bay (about 300 nautical miles across), the Gulf of Saint Lawrence and the internal waters of the Arctic archipelago. The EEZ of the European Union is shared, so vessels or a national from one country can fish in another country's EEZ. The combined zone amounts to 25 million km², making it larger than the United States' zone, the largest of any single country. '"See: Common Fisheries Policy. Due to its numerous overseas départements and territories scattered on all oceans of the planet, France possesses the second-largest EEZ in the world, covering 11,035,000 km² (4,260,000 mi²), just behind the EEZ of the United States (11,351,000 km² / 4,383,000 mi²), but ahead of the EEZ of Australia (8,232,000 km² / 3,178,000 mi²). According to a different calculation cited by the Pew Research Center, the EEZ of France would be 10,084,201 km² (3,893,532 mi²), behind the United States (12,174,629 km² / 4,700,651 mi²), but ahead of Australia (8,980,568 km² / 3,467,416 mi²) and Russia (7,566,673 km² / 2,921,508 mi²). Turkey's declaration of casus belli is not related to the EEZ issue. Aegean Sea is a semi-closed sea which has a special nature. Moreover, Turkey is not among the signatories of UNCLOS which allows countries to expand width of their territorial waters up to 12 nautical miles. Besides, Turkey is a persistent objector to the relevant article of UNCLOS. In 1995, just after Greece's ratification of UNCLOS, Turkey declared that if Greece expands the width of her territorial waters over 6 nautical miles (e.g. 12 nautical miles), Turkey would conceive this action as a containment attempt and a direct offence to her sovereignty. So, Turkish Parliament decided that if Greece attempts to expand the width of her territorial waters it would be a cause of war (casus belli). EEZ problem -which is waiting for a viable solution- is just another problem between Turkey and Greece besides other problems. Portugal has the 3rd largest Exclusive Economic Zone of the EU and the 11th in the world. Japan has disputes over its EEZ boundaries with all its Asian neighbours (Russia, South Korea, PRC and ROC). The above and relevant maps at the Sea Around Us Project both indicates Japan's claimed boundaries, and does not take into account neighbouring power's claims. New Zealand's EEZ covers 4,083,744 km², according to the Sea Around Us Project, which is approximately fifteen times the land area of the country. Sources vary significantly on the size of New Zealand's EEZ; for example, a recent government publication gave the area as roughly 4,300,000 km². These figures are for the EEZ of New Zealand proper, and do not include the EEZs of other territories in the Realm of New Zealand (Tokelau, Niue, the Cook Islands and the Ross Dependency). Norway has a large exclusive economic zone of 819 620 km² around its coast. The country has a fishing zone of 1,878,953 km², including fishing zones around Svalbard and Jan Mayen. The fact that the European Union shares its economic zones was a big reason why Norway did not entered the EU as a member. ↑ New Zealand Ministry for the Environment (2007). Improving Regulation of Environmental Effects in New Zealand’s Exclusive Economic Zone: Discussion Paper - Introduction. Published August 2007, Publication number ME824. ISBN 0-9784783-0160-1. Accessed 2006-01-07.